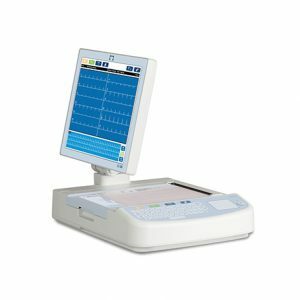 The latest innovation of the ELI family of resting electrocardiographs by Mortara, the ELI 380 with ERGO display offers an exclusive ergonomic design to assist ECG technicians in streamlining workflow and improving the way they interact with the electrocardiograph as they care for their patients. The electrocardiograph offers a swiveling and tilting 17-inch touchscreen display that allows the user to maneuver easily, even in tight spaces. Its capacitive touchscreen can be rotated to improve viewing and operation of the electrocardiograph. In addition to the VERITAS algorithm for ECG interpretation, ELI 380 offers the BEST 10 feature, capable of automatically selecting the best 10 seconds of noise-free ECG within the memory buffer. Together, the Wireless Acquisition Module (WAM), large memory capacity, complete workflow management, bar code support and many other features, make the ELI 380 with ERGO display the ultimate electrocardiograph for today’s cardiology departments. Impact-resistant, high-resolution 17 inch color display and sealed keyboard are designed for demanding patient care environments. “Instant-on” feature enables clinicians to quickly power up and immediately begin ECG acquisition. Smart keyboard design enables more thorough disinfection than electrocardiographs utilizing traditional keyboards. Simplified disinfection assists facilities in complying with Infection Prevention and Control Programs and the recommendations of the Center for Disease Control. Widely recognized Mortara resting ECG interpretation algorithm uses gender specific and adult and pediatric criteria to provide a silent second opinion for resting ECG interpretation. Displays hook-up confirmation which includes detection of lead reversals. Securing ePHI data is promoted with LDAP integration enabling authentication and authorization of users. Additionally, bidirectional network encryption ensures the protection of sensitive ePHI in ECGs, orders, and patient lists. When enabled, a simple scan of the patient’s ID bracelet automatically initiates a search for the patient’s ECG order. If no order has been placed, the ELI 380 searches for the patient’s demographics via HL7 ADT. simplifies ECG acquisition by reducing clinical review time and eliminating the need for repeat ECGs. Equivalent in size and weight to a traditional patient cable, the WAM™ (wireless acquisition module) provides freedom of movement for clinicians. A single button press at the WAM acquires an ECG or prints a rhythm strip. Bidirectional communication via LAN or wireless LAN enables connectivity to Mortara’s Pyramis®, HeartCentrix®, E-Scribe™ and Athena products, as well as to third party EHR, PACS and CVIS. ECG reports can also be exported via a USB flash drive for direct transfer to a compatible electronic information management system.